2006: Doctor Who - Revisiting SCHOOL REUNION | Warped Factor - Words in the Key of Geek. Tony’s going back to school. School Reunion was the first televised episode to star the Tenth Doctor that wasn’t written by showrunner Russell T Davies. That’s important, because the relationship between David Tennant’s Doctor and Billie Piper’s Rose had developed an infantilism in the first two episodes of the series, the two of them acting like giggling children who wouldn’t shut up. In Toby Whithouse’s script, they’re both brought literally back down to Earth, working in the modern world after Rose’s boyfriend-maybe-ex-whatever, Mickey, calls them home to investigate lights in the sky and sudden school transformations. They’re immediately more grounded than they have been when they were popping in like space-time tourists on other people’s reality – an irony, given that they both take positions of some responsibility in a school, he as a stand-in physics teacher, she a replacement dinner lady. The point being they’re much wore watchable without their silly grins and doe-eyes and banter. If you watch Tennant’s performance in School Reunion, there’s much less in the way of flippant comedy, and much more in the way of drama, and while he’s already proved by this point that he can do the drama sometimes required in Doctor Who, it’s actually Whithouse’s script that first gives him the chance to be properly heroic without the crutch of the long chatterbox speeches, and that forces the Tenth Doctor to confront a dramatic reality without being able to bounce his way through it by running and quipping and giving a speech. Tennant is especially impressive in the scenes with Brother Lassa (played by Buffy The Vampire Slayer’s Anthony Head), both in terms of their silent Full Noon stare-off, and their quiet verbal duel that has both power and menace in it. In fact, while his rage in New Earth showed the power this new Doctor was capable of mustering, it’s here, almost whispering with Lassa, that the Tenth Doctor revisits his scowling cowboy moment that took the audience’s breath away in The Christmas Invasion. Having defeated the double-crossing Sycorax leader with a satsuma, ‘No second chances,’ he declared, walking towards us. ‘I’m that sort of a man.’ That’s the sense that’s alive and well and bristling through his words to Lassa in this episode – ‘If I don’t like it, it will end. You get one warning. That was it.’ It’s a scene that allows Tennant to bring out a side of his Doctor that he would re-use on occasion, and which would be inverted for a new dimension when he eventually met River Song for the first time. He might look like a young stripling, but as he says here, he’s ‘so old now,’ that he’s gone beyond the time in his life when his mercy was an ever-renewing thing, when he had that wide-eyed optimism about the universe. Now, you get one chance to prove you’re worthy of staying alive. And this Doctor can be merciless – ask the Sycorax. 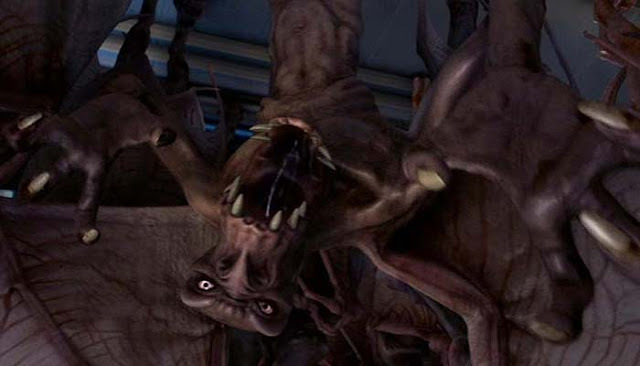 In a way, this scene reveals a ripple of extreme danger in the Tenth Doctor’s make-up that would eventually reveal itself as the Time Lord Victorious. He may bounce and grin and giggle his way through the universe these days, but Whithouse makes that feel like a survival mechanism, as much as the Ninth Doctor’s policy of not getting involved with people was. You get a sense that this Doctor’s one warning policy is his way of keeping one hair’s breadth of contact with the Doctor he used to be before the Time War, when he was still comparatively innocent, but that, as much as he’s relieved on days when everybody lives, there’s a part of him - the part that still burns with grief and guilt for his part in that war - that needs people, or species, to disappoint him, to not take the warning, because then they give him a vent for all his pain, emerging as a terrible vengeance from which he can excuse himself because he gave them their chance. 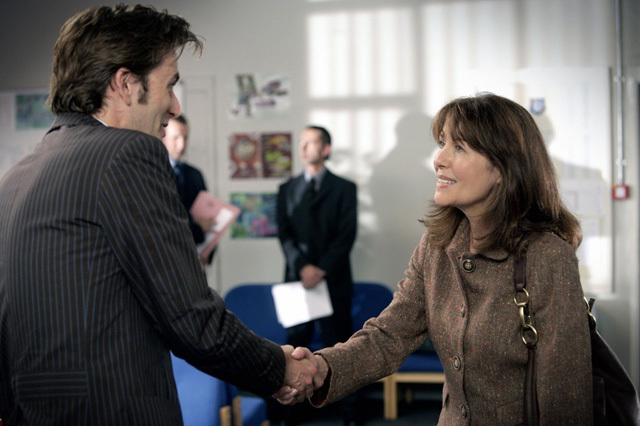 As Donna would later tell him, ‘sometimes, you need someone to stop you.’ You can see the seeds of that Time Lord in School Reunion. But School Reunion is by no means all doom and gloom. In fact, the main thrust of School Reunion has nothing to do with the alien threat at all – it’s half a love song to the companion, and half a consideration of the consequences of being one. When the Doctor first sees Sarah-Jane, Tennant’s smile would shame the sun, and it’s three smiles in one: it’s the smile of the Doctor finding one of his favourites again; it’s the smile of David Tennant, who became a Who-fan watching Elisabeth Sladen in action, and can’t quite believe he gets to be the Doctor to her Sarah-Jane, and through Tennant, it’s the smile of every fan, who loves particular companions, and Sarah-Jane especially, and who punches the air to see her back in Doctor Who. 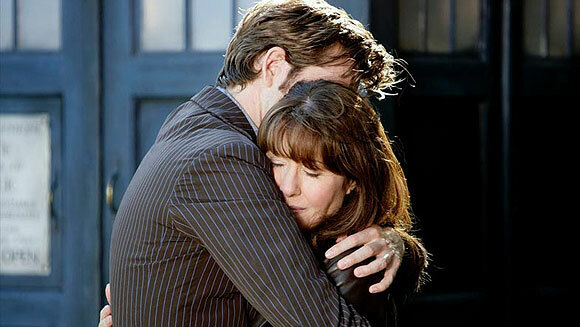 The episode explores what the Doctor calls ‘the curse of the Time Lord’ – having to separate from people or watch them wither and die while you go on. It explores how companions pick up their lives again after traveling with the Doctor – and if they ever really do. It confronts the Doctor with the reality of the damage he did by the peremptory way he parted from Sarah-Jane, and it forces Rose to give her relationship with the Doctor a reality check, confronted as she is with Sarah-Jane, who her Doctors have never even mentioned. There are lessons to be learned from every perspective – Sarah-Jane learns why the Doctor could never bring himself to come back for her; the Doctor learns the cost of his actions; Rose learns the scale of the Time Lord life, and how inevitably short a part in it she will be able to play. Mickey learns that he’s the tin dog. As the Krillitanes force the children of Deffry Vale School to crack the Skasis Paradigm, the Godmaker Equation that will give them unlimited power over time, space and matter, and Brother Lassa, masquerading as Headmaster Mr Finch, offers ultimate power to the Doctor, to save all the species he cannot save, including the Time Lords, these lessons hit home. In a glorious nod to Genesis of the Daleks, the Doctor, faced with the ultimate moral temptation, listens to Sarah-Jane, who tells him everything has its time, and everything ends. No-one should have the power of a god – perhaps especially not a good man who has lost so much. School Reunion is by no means a perfect Doctor Who episode – the idea that creatures who produce an oil that makes children super-smart are somehow rabidly allergic to their own oil is intensely ludicrous, and the CG bat-form Krillitanes were naff even at the time of broadcast. Ten years on, they’re ten years more naff, surpassed only in terms of deeply dodgy CG monsters in 21st century Who by the Lazarus creature in Series 3. But Anthony Head is supremely effective as Mr Finch, bringing the ‘man in the black hat’ role a supressed snarl and a polite spitefulness that it’s delicious to watch. And his bizarre wide-mouthed scream – apparently just ‘a thing’ that Head can do – is unnerving in the extreme, adding layers to his menace by seeming to physically ‘scratch the surface of the morphic projection’ to show the Krillitane emerging through his human form. 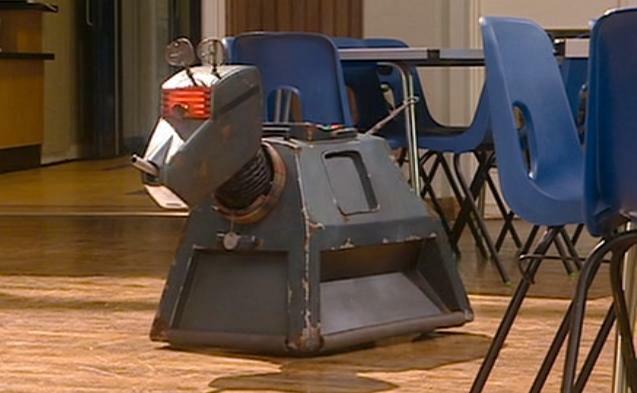 Really though, School Reunion is a feast for fans, making us punch the air at Sarah-Jane’s return, and then do it all over again when K9 is revealed. It resolves the bitter taste left in our mouths by the end of The Hand of Fear and makes everything alright again between the Doctor and Sarah-Jane, while making Rose re-examine her life-choices, and significantly, proving to Mickey that he doesn’t want to be the comedy relief in anyone’s drama – he wants to be effective, reliable, the best Mickey he can be, so he signs on to the Tardis at the end of the story, finally ready to take on the journey into time and space, with all its temptations and perils. As she struggles to come to terms with the Doctor’s long life and the fact that she’s one of many companions he’s had and will have, Mickey joining the crew makes Rose feel that little bit less special again, meaning there will have to be a readjustment of her world going forward. School Reunion is a fan favourite because it fulfils dreams that we’ve had since the 1970s, of Sarah-Jane returning to the Doctor’s life. But it also uses that opportunity to right wrongs, and examine the realities of a life travelling with the Doctor, for better and worse. Ten years on, and with allowances made for the naff CGI, School Reunion is still head and shoulders over what’s come before, allowing David Tennant’s Tenth Doctor to be the hero he can be, beyond the chatterbox character that had personified him up to that point.